The title, Behemoth, derives from the Hebrew word Behemah-a beast, an enormous creature, monstrously huge and vast. It is an apt description of the State on the eve of the twenty-first century. Loved by few, vilified by many from all perspectives, it nonetheless continues to grow; by turns rivaling and co-opting that more pleasant-sounding word: Society. Political sociology aims to define and understand the interrelationship between these two huge terms: State and Society. Continuing in a path begun by Horowitz in the 1950s in The Idea of War and Peace in Contemporary Social and Philosophical Thought, expanded upon in the 1970s with Foundations of Political Sociology, this summing up in the late 1990s is an effort to extract and evolve the canon of political sociology. Starting with Montesquieu, Horowitz proceeds through the European experience of Rousseau, Tocqueville, Hegel, Marx, Durkheim, Sorel, and Weber. He then takes the field on its tangled migration to America with the Frankfurt School in exile, followed by searching chapters on Schumpeter, Mills, Arendt, and Huntington, among others. The result is a stunning revaluation of the intellectual sources of the present day divisions between statists and socialists, welfarists and individualists, advocates of dictatorship and of democracy, mandated rules and voluntary association, hard realists and soft utopians, a world without states and a world with a single state. Horowitz does not offer the usual evolutionary notion of doctrines, but a canon embedded in and embattled with the societies they aim to serve or overthrow in the present as in the past. The result is a major recasting of the theory and practice of social science and normative frameworks. The final chapter offers Horowitz's own prognosis of what we can expect in the recasting of the Welfare State to include the Welfare Society, and its growing nemesis the global economy which threatens to engulf State and Society alike in a return to civilizational concerns. This is an essential text for policy-makers and social scientists interested in macroscopic changes in the political order. "Horowitz's book could be compared with Raymond Aron's Main Currents in Sociological Thought (1968) and Irving Zeitlin's Ideology and the Development of Sociological Theory (1968) in that it traces the development of attempts, beginning with that of Montesquieu, to relate the institution of the state to the complexity of associations that make up society." "Behemoth is truly a major achievement, comparable in scope and intellectual depth to Raymond Aron's history of sociological doctrines. His thoughtful exploration into founders and current figures of political sociology belongs to the best social science has offered in recent decades." "Behemoth is a remarkable undertaking; an ambitious and profound exploration of major currents of Western social-political thought and their relationship to one another. Horowitz succeeds in shedding new light on both the relationship between state and society in its historical and contemporary aspects and on the relevant ideas of virtually all major figures in Western social-political theory. It is a volume that demonstrates the compatibility of true scholarship, the enduring traditions of Western ideas and current social-political concerns." "Horowitz's aim is to delineate the canon of political sociology, the heart of which is the theory of the relationship between the twin and swelling behemoths: state and society, and he succeeds brilliantly. Horowitz achieves much more. Building on his Foundations of Political Sociology he guides the reader through an extraordinarily elegant critical analysis of main currents of social thought, proceeding from the late Renaissance through the Enlightenment to our own time. Social scientists and their students will find in Behemoth nothing less than a crucial aspect of the liberal arts education that so many of us have unfortunately missed." "Behemoth is an impressively ambitious work, testimony to a formidable scholar with universal interests. The hub of the book is exactly where it needs to be today: an investigation into the dual nature of the state.... We are in danger of forgetting that the state can and should be an agency for civilized order. Behemoth seeks to advance a more balanced perspective on these matters and in doing so sets an example and a tone I wish more scholars would emulate." "Irving Louis Horowitz's latest book Behemoth is well up to his usual very high standards. Behemoth is scholarly, original, elegantly and vigorously written, and timely. With the collapse of the Soviet Union, political ideas and social analysis are in disarray. Horowitz re-focuses political sociology sharply on the core issues--freedom, equality, and enterprise." "Behemoth is arguably Irving Louis Horowitz's masterpiece. He provides nothing less than a conceptual map for understanding the complex ties that bind state and society in the modern world. The intellectual portraits of the great political and social theorists limned here are illuminating through and through, models of how to confront the serious thought of the past and present in order to understand enduring realities. Horowitz has produced a classic of sociological and philosophical reflection; one that combines wisdom and moderation in a manner inspired by its heroes, Montesquieu, Tocqueville and Weber." "Reading "Behemoth" is the intellectual equivalent of watching a consummate athlete break the world record. Elegantly written, dispensing with the obligatory academic shibboleths, "Behemoth" is a breathtaking tour de force. Anyone willing to accompany the author on his journey, revisiting the key themes underpinning the major theories of political and social change, will be amply rewarded with insights into the deepest dilemmas of modern life that elude the self-styled professional punditry that nowadays passes for intelligentsia. 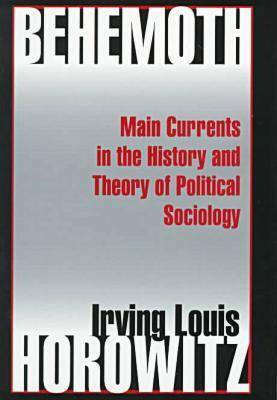 The book's subtitle, "Main Currents in the History and Theory of Political Sociology," refers to a critical yet generous ("there are no villains in this book") overview of the most important efforts by eminent thinkers starting with Montesquieu, followed by Rousseau, Hegel, Tocqueville, and Marx, among others, alongside the canonical sociologists including Durkheim and Weber, to explain the relationship between state and society. That relationship - the question of how political system and the social order interact - is what this superb book is about. The word "Behemoth" is roughly synonymous with "Leviathan" - Hobbes's all-powerful state - but Irving Louis Horowitz uses it primarily as a complement to "anarch," which refers to "society," or perhaps the "un-state," which doesn't merely precede the political (as it did for Hobbes) but complements it, opposes it, or, paradoxically, both. How to understand the tension between these two poles of human organization - the state and society? Simple dichotomies such as objective-subjective, private-public, conservative-liberal, will not do. The synthesis to which this narrative leads is the eventual, current merging of state and society, which he calls "the welfare state" (as distinguished from "the welfare society"). The modern "behemoth," a bewildering product of contradictory forces and unintended consequences, though ostensibly, at least initially, benevolent, threatens in the end to smother the individual ( or rather, more comprehensively, if not less vaguely, the "human forces" which encompass the complex factors that "resist the blandishments of the welfare state"). But is the modern behemoth not "democratic" (with all the honorific connotations)? Horowitz observes that "the ease with which the welfare state can be detached from any semblance of democratic moorings is itself a source of deep concern for liberals as well as conservatives. There is an uneasy feeling that the uncontrollable urgings of the welfare state combine the worst features of the State, its repressive potentials, with the worst features of the Society, its unbridled utilitarianism." Sometimes euphemistically described as either the "liberal" state or "open" society, the new Behemoth is "indifferent to ideological labeling, whilst becoming remarkably attuned to the demands of the political elite and the social mass at the same time." Marx would not be alone in finding such a proposition incomprehensible; so would most social "scientists" even (or rather, especially) today. What then are we left with? On one side is "the oft-discarded and discredited notion of civilization" - sometimes synonymous with "culture" -that transcends any one nation-state, and on the other, various modern utopias such as the idealized "community," whose presumed common interest the State is supposed to fulfill. Neither can save us from what, like it or not, is Behemoth as a force unto itself and, more ominously, "an end unto itself." Progress has always been an illusion; technological advance can plunge humanity into the abyss as easily as its absence, if indeed not more efficiently. Though refusing to indulge in easy solutions, the book ends on a note of hope, if certainly not euphoria. At least we cannot say we have not been warned."